Titus County Sheriff’s Officers acted on information that an out of town resident had been involved with illegal trafficking of controlled substances in the Northeast Texas area that included Titus County. A team of Sheriff’s Investigators including undercover officers agreed to meet a male whose name is not being disclosed at this time, at a parking lot along West Ferguson Road. The male suspect and his adult female passenger unwittingly sold methamphetamine to an undercover officer who then notified other team members waiting nearby of the transaction and the suspect’s direction of travel. When awaiting deputies in a clearly marked Sheriff’s Vehicle attempted to conduct a stop of the suspect vehicle, the driver of the suspect vehicle immediately commenced fleeing from the deputies who activated both flashing lights and sirens. The driver of the suspect vehicle then continued to flee at a high rate of speed taking exaggerated evasive action in his efforts to elude law enforcement authorities. Ultimately, the suspect attempted to flee north on North Jefferson Avenue turning right on dead end Fairway Lane near the Mount Pleasant Country Club. While coming to a stop the male driver fled onto the nearby golf course as the female passenger was detained by a Texas State Trooper. At that time, a search party including units from Titus County Sheriff’s Office, Mt Pleasant Police Department, and Texas Department of Public Safety Highway Patrol, was formed as efforts continued for a time to locate the male suspect in the area near where the fleeing suspect abandoned the vehicle. 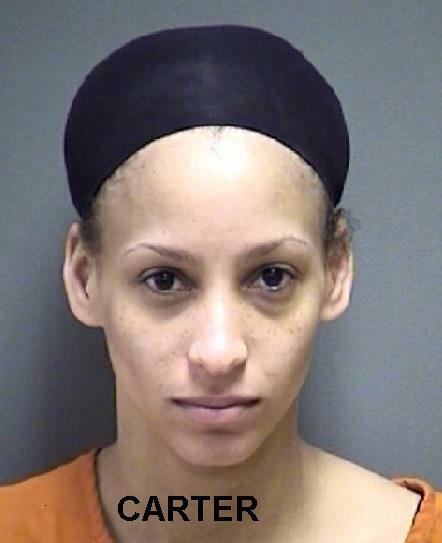 The female passenger who was later identified as 26-year-old Karah Michelle Carter, of Bowie County, was arrested for the First-Degree Felony Offense of Delivery of a Controlled Substance in an amount over four grams but less than 200 grams. The male, who fled from the vehicle, is known to authorities and efforts to apprehend him are ongoing.